Ah yes, I didn't see that! Sorry I know this is old. Is that right? Or are there some I should put into the router from BT? or should I have BT auto give me some? Still no IPv6 for me. It's the same with Sky, that the customer DNS servers are not IPv6-enabled even though customer connections are. Of course that doesn't mean IPv6 addresses can't be looked up, it just means that a DNS server without an IPv4 address (unlikely for some time) will not be able to be accessed by the Sky/BT customer DNS servers . So not likely to cause lookup failures for quite some time, but something that both ISPs should rectify. 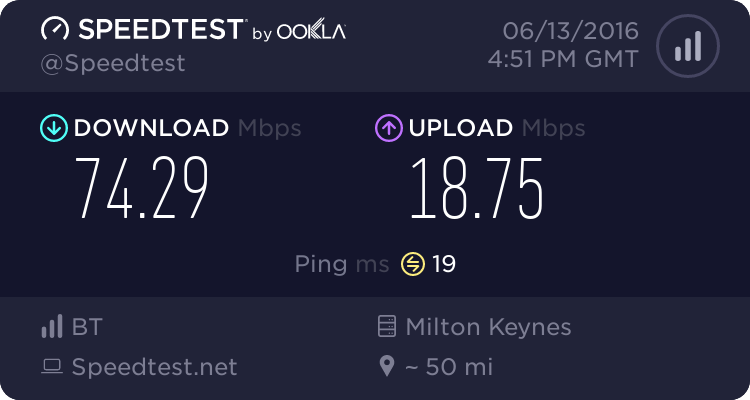 I posted on the BT forums just the other day asking for IPv6 to be enabled, take a look at my thread here if you like. As mentioned, they can't do IPv6 on a per-user basis for some reason, but when I installed OpenWRT onto an old router and swapped out the HH5, I was able to force it to get me an IPv6 address. Just like idmanager, I am also on the Leabrooks exchange. Previous Connection: BE Pro (24/2.5) -- Left because of Sky takeover.